32nd Shop is a supplier of mobile device cases and accessories based in Devon. They came to Fruition as an online distributor who were looking to expand their business into a customer facing retail outlet on the high street in Exeter. This was a multi-discipline design project for which were tasked with designing the interior of the shop, refreshing 32nd Shop’s brand identity, creating signage for the shop and proposing packaging design for a selection of their products. Fruition have created a cohesiveness to to our brand identity that has increased our credibility as a high street retailer and added recognition for our business. The 32nd Shop brand now looks sharper, the message is clear and has more impact. We are very pleased with the outcome, and got exactly what we wanted. The shop has received many comments from customers who are impressed with the new identity. At our first meeting with Hui from 32nd, he briefed us on the interior and branding requirements for the new shop. Working to a tight deadline we were tasked with creating a new brand identity. We started out by researching other companies who traded with mobile and smart device accessories in which we found how important vibrant colour use was. The products 32nd sell are supplied directly from China – a unique selling point and with Hui and his wife both originating from China we were keen to explore Chinese numerology. Interestingly the number 32 in Chinese culture preaches that the only sure constant in life is change. This tied in well with the fact 32nd were selling products that would change the appearance of a mobile and smart device. The number 32 has a hexagram associated with it, which is known as “Heng” this shape (which could be compared to an uppercase H) provided the basis of the brand identity. Hui and his wife loved the direction of the brand and we developed a logo which was later applied to the storefront and packaging. 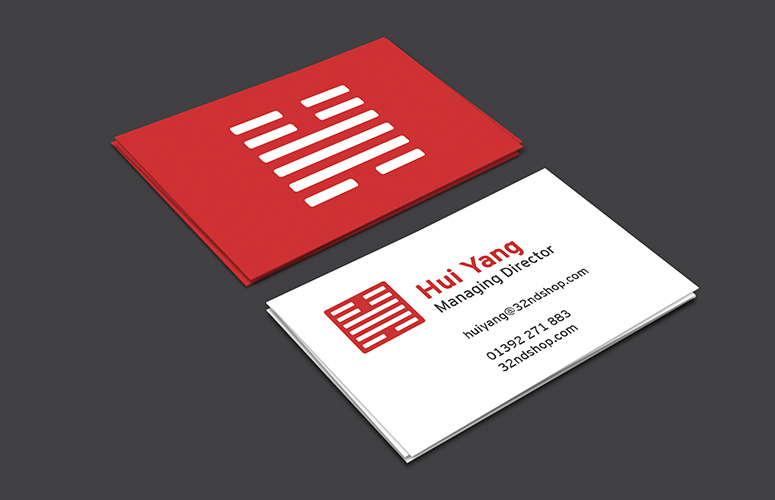 If your business needs a rebrand or new website – get in touch! All the details can be found on our contact page.